Clear Spring, Md.—On Saturday, October 10, the University of Maryland (UMD) Maryland Space Grant Consortium Balloon Payload Team celebrated its 50th tracked high-altitude balloon launch. Since the program began in 2003, there have been 49 tracked balloon launches that took student-designed and built payloads to the edge of space. 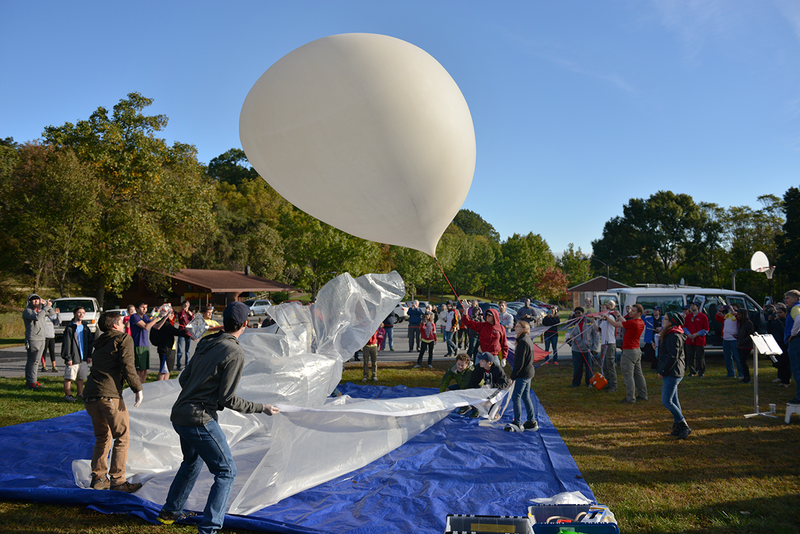 Students successfully launch their 50th tracked high-altitude ballon Saturday, October 10, from the Claud E. Kitchens Outdoor School at Fairview in Clear Springs, Md. The Maryland Space Grant Consortium (MDSCG) Balloon Payload Program (BPP) provides easy access to “near-space” for students who cannot afford a launch vehicle. The BPP program is part of Space Grant's mission to contribute to the nation’s scientific enterprise by funding education, research and public service projects through a national network of university-based Space Grant consortia. Students use helium-filled weather balloons to lift small payloads—cargoes tethered below the balloon—to the edge of the atmosphere. The balloons reach up to 85,000-100,000 feet in altitude, and at that height, payloads experience space-like conditions in terms of pressure, temperature, radiation environment. 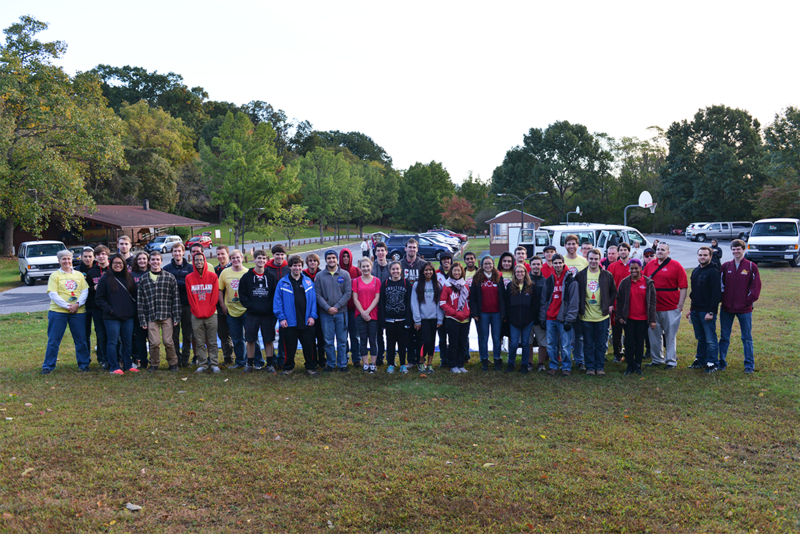 Saturday's launch from the Claud E. Kitchens Outdoor School at Fairview in Clear Spring Maryland, included six payloads engineered by University of Maryland and Capitol Technology University students. During the flight, the balloon reached an altitude of 94,000 feet and covered approximately 50 miles from the ascent location to the payload landing site. The payloads performed experiments both on the way up and on the way down, and are designed to perform tasks such as collecting atmospheric data and visual imaging transmission to materials testing and telemetry and tracking. "It really is a student-driven program," said Dr. Mary Bowden, the principal investigator for the program and a professor at UMD. "This program gives students a fun, low-cost initiative to learn hands-on skills and gain valuable engineering design expertise." Maryland is one of only a small number of universities nationwide to successfully launch and track so many balloons, and Bowden has been heading up the program at Maryland since it began. She has organized and attended every launch to date, but she credits the students with fueling the program's momentum at Maryland. "We have the most fantastic students," explained Bowden. "They are so creative and dedicated, and they provide continuation for the projects by training the next class of students coming on board." Students engineer every aspect of the launch program from payload design and construction to vehicle launch, recovery and post-flight data analysis. Developing the projects requires students to learn skills in a variety of different areas—such as electronic circuits, thermal design, structures, sensors and 3D-printing—as well as teamwork to pull off the final project. "Working on payload projects, we share those skills with each other, benefitting the team and the individual," explained Mechanical Engineering senior William Gilbert. "The balloon payload program really allows young engineers to apply their theoretical knowledge to a real-world application. We can also make mistakes, learn from them and try again." Gilbert has been a member of the balloon payload team since 2013 and currently heads the Command Module and Supersonic teams. The 50th balloon launch carried payload projects built by students from the University of Maryland and the Capitol Technology University. "The construction of a payload for a balloon is a microcosm of a NASA flight mission," said Terry Teays, the Assistant Director for MDSGC. "This program allows us to introduce students to the excitement of flight projects, and serves as a stepping stone to more advanced projects. The importance of involving students in research at the earliest opportunity cannot be overemphasized." During the pre-launch festivities, Bowden thanked Teays and MDSCG Director Richard Henry for their continued support and encouragement of the program over the years. She presented them with plaques featuring 3D-printed turtles that flew on previous balloon payloads. "This has been an outstanding program for many years and many launches," added Teays, who makes an effort to attend as many balloon launches as possible. "It has served as a source for many students who went on to accomplish significant things in STEM fields. Professor Mary Bowden is especially to be commended on her dedication, and her ability to engage and inspire her students." Image taken from onboard the 50th balloon launch as it reaches near space. The Command Module (CMD) is the main tracking and telemetry system for the Balloon Payload Program. Redesigned into its fifth version for this launch, the module improves and enhances all three major payload subsystems: electronics, structure and power. Host Payload is a testbed for the use of advanced materials and manufacturing processes in payload construction, provides high resolution video throughout the flight, and it is testing a new generation of electronics called Balloonduino. Host payload will be the first payload of the Balloon Attitude Determination and Stabilization System, slated to fly next semester and provide stabilization during the rigorous motion of balloon flight. Bach's Optic Box can sense temperature, humidity, barometric pressure, UV intensity and dust in the air. The box will measure ozone as it rises. The goal is to correlate changes in UV intensity and dust in the atmosphere as the balloon enters the stratosphere. The payload also experiments with a GoPro to take still images instead of video. WhiteBox houses experimental technologies for the Balloon Payload Program. This marks their second flight, and includes 900 MHz radios tested for data transmission capabilities of images. One radio band will send periodic images during flight and the other will send XBee and telemetry data. Students review data received on the ground at tracking stations in the chase vans for further analysis. The latest in the SPECTRE series, v.4 features a 3D-printed chassis with eight solar panels. The objective of this flight is to determine the in-flight recharge capabilities of these lightweight solar panels. Past flights studied the solar panels' voltage outputs with respect to altitude and yielded encouraging results. This version will begin testing the end-goal of SPECTRE: increasing battery life while reducing payload weight. This payload is a prototype of a CubeSat that uses a block of silica aerogel to capture microdebris in orbit. It is also testing an innovative hinged, Nichrome-activated lid that will protect the aerogel until the lid opens after reaching the desired altitude.